Research reports that most individuals with autism respond positively to music (DeMyer, 1974; Edgerton, 1994; Euper, 1968; Snell, 1996; Thaut, 1992). Music is a very basic human response, spanning all degrees of ability/disability. Music therapists are able to meet clients at their own levels and allow them to grow from there. The malleability of music makes it a medium that can be adapted to meet the needs of each individual. 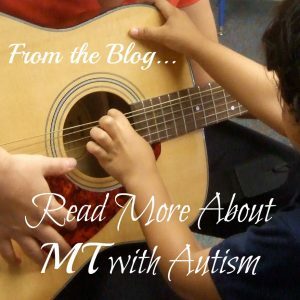 Want to know more about Music Therapy with Autism? Please Note: Rhythms For Living no longer offers services in South Florida. This website is an online resource for parents, teachers, and therapists as a source of information, education, and resources of ideas, fact sheets, recommended resources, and eBooks. To find a music therapist in your area please refer to cbmt.org or musictherapy.org.